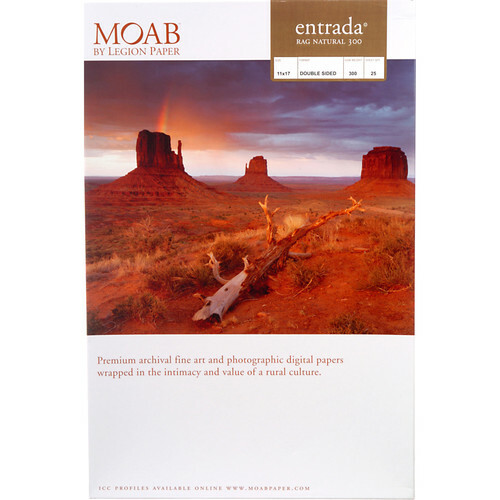 Produce fantastic prints with vivid colors and high sharpness with the matte surface of Entrada Rag Natural 300 from Moab. Machine-made from 100% cotton fiber, this double-sided paper offers superb ink handling and a traditional feel. It also forgoes all optical brighteners for a natural brightness and whiteness of 84%. Also, the 22.5-mil thick sheets are acid and lignin free as well as water resistant and calcium carbonate buffered in order to ensure true archival longevity. This paper is available here as a 25-pack of 11 x 17" sheets. Box Dimensions (LxWxH) 18.0 x 11.4 x 0.9"
Entrada Rag Natural 300 Paper (11 x 17", 25 Sheets) is rated 4.2 out of 5 by 6. Rated 4 out of 5 by robinseatworms from Sculptural Possibilities I used the entrada rag natural 300 2 sided matte paper as a sculptural material. It was important to have the same imagery on both the front and back of the paper and for the paper to have a nice weight to it. Eventually, a three dimensional object was made topographically with the paper I had double sided/printed. Texture of the paper was also a plus for this project. For the most part, loading the paper wasn't at issue but occasionally there would be a difficult page that wouldn't feed in so well. Did not have any problems with the paper jamming while printing. Rated 1 out of 5 by Anonymous from Warning! I do fine art printing as a side business, and have used this paper for years, no problems. In this last order I had anywhere from 3 sheets to almost a whole box that had defects. Embossed lines running down the middle, damaged corners, embossed half circles in a corner. I don't recommend this paper, they seem to have some serious QC problems and aren't inspecting the final product, just boxing and shipping junk. Rated 5 out of 5 by Russell from great paper I use this paper to print landscape photographs. It produces great colors. The double sided feature is handy, no worry about the correct side. I like the 11x17 size because the aspect ratio prevents unwanted cropping. Does not tend to curl and produce head strikes like some paper. Rated 5 out of 5 by James from Real Paper! I use Entrada for fine art printing. It takes the edge off of the digital look and gives it more of a handcrafted/darkroom feel. The warmth and the feel are as close to Agfa 118 as I have found and the weight makes it perfect for portfolio use. Rated 5 out of 5 by Anonymous from Great paper, beautiful output This is a great paper and the output is beautiful. I print black and white with quadtone process and the results on this paper is just amazing. One of the best from Moab.